When it comes to pizza toppings, I tend to be a bit adversed to cooking the toppings before having to cook the pizza- I only do it if the topping is really better cooked. 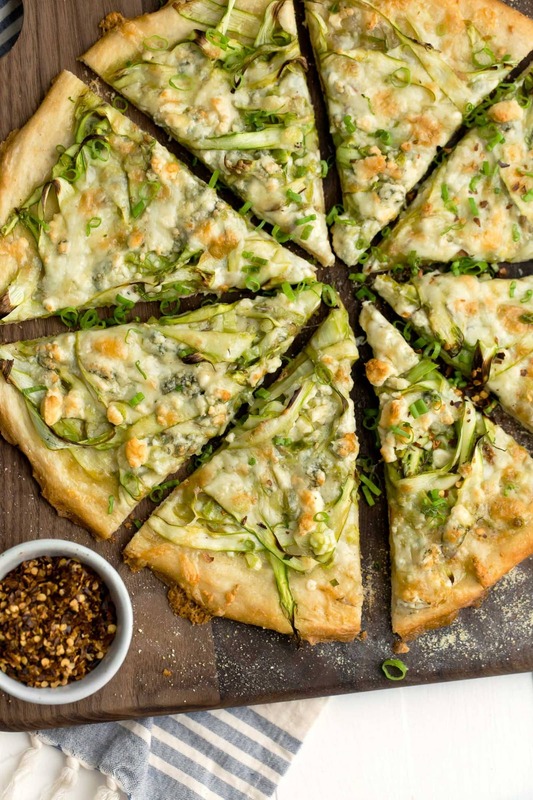 With this asparagus pizza, by shaving the asparagus, it cooks perfectly with the pizza. Also, if you’ve never shaved asparagus before- it can be fairly easy. I have a quick video below but the key is to find a flat-handled utensil to lift the asparagus off the cutting board. I use a kitchen brush but anything that’s flat will work. Also, look for slightly thicker asparagus- it’s easier to shave! 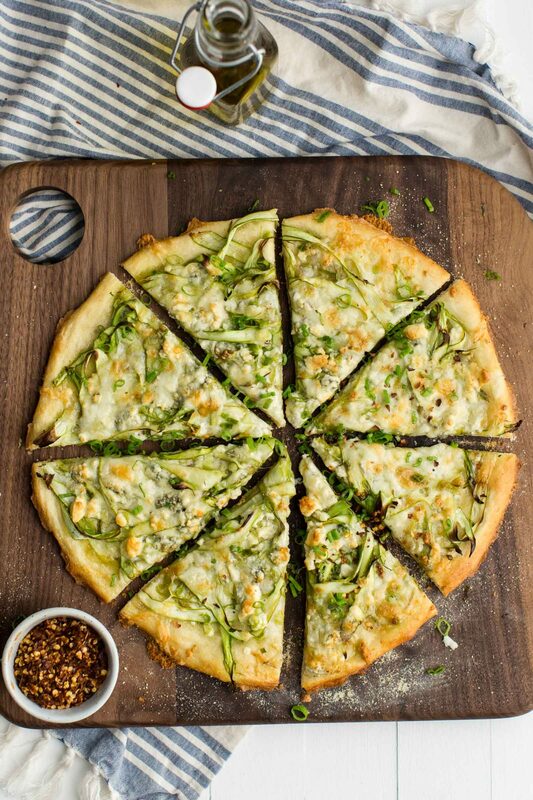 Once you master the shaving technique, this asparagus pizza becomes a breeze and is one of my favorite ways to celebrate spring. Of course, I know that not everyone is a fan of gorgonzola, so below are some ideas to work around that. Cheese: Swap in your favorite pizza cheese. I personally love smoked cheeses (a smoked mozzarella is great) or try goat cheese in place of the gorgonzola. Gluten-Free: Want pizza but need it gluten-free? Try your hand at making your own pizza crust. Scallions: One of the things I love most about spring is the wide array of Allium’s at the market. Try green garlic, spring onions, or spring leeks in place of the scallions. You might notice that I love shaved asparagus. It’s easy to use (both cooked and raw) and I think the thin slices are a wonderful way to show off this beautiful spring produce. If you want to keep shaving, here are a few more recipes you can try. + Recipe first posted on April 16th, 2012. Last updated on April 10th, 2016. This pizza looks fabulous! 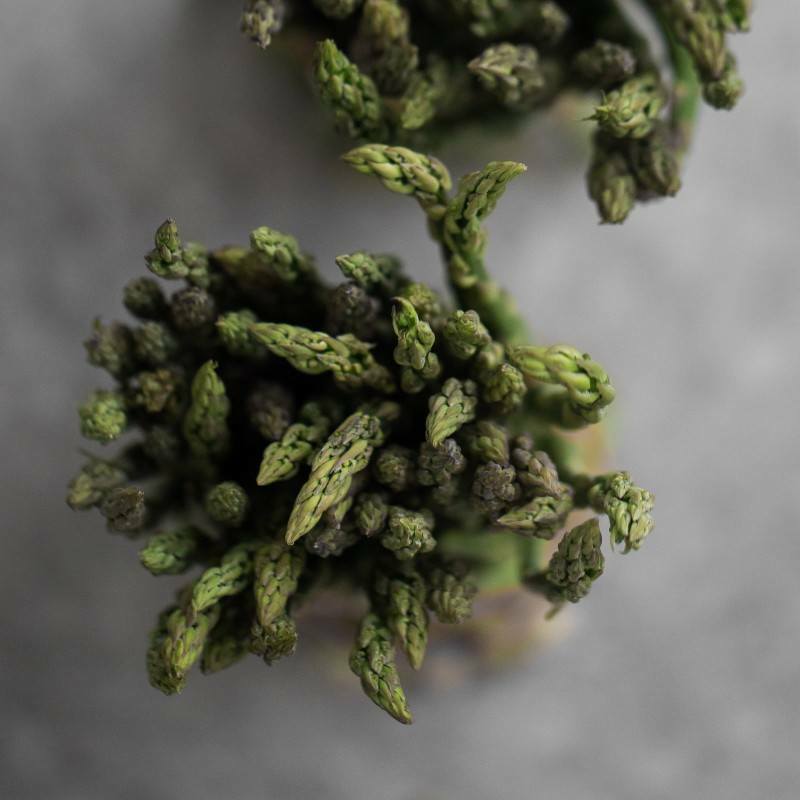 I just posted a recipe for a spring salad featuring roasted asparagus and blue cheese – such a delicious combination =). I am in agreement with crap collection. I moved to the US with one big bag 4 years ago, now I have stuff that can fit a small house. Sadly though, it’s not furniture or anything like that, it’s mostly books and papers. Why oh why do I carry those old papers I wrote in college? No clue. This summer, when I have time… They will be discarded. I love the simple pizza, it’s so green and fresh! There is a pizza dough in my fridge right now waiting for me at home. And I have asparagus and gorgonzola, also. I might be making this tonight. Asparagus and gorgonzola! Sounds delsih. Isn’t it amazing that amount of junk we get? When we were first married we moved into our two bedroom apartment and it was empty except a old, yucky table and one bed that was given to us. Then we got the wedding presents (Yay for shower curtains, etc!). Then someone gave us this. My students gave me tons of THAT. I couldn’t help but buy this do-dad. And now, we have STUFF. Lots of it. Every Spring I go through all of my cupboards and purge, but I need to be better at it. Good for you! I love the feeling of purging- it feels good to simplify! Beautiful post! My favorite line: “So many things in life are complicated, pizza shouldn’t be one of them.” Love. Thank you Sarah! I can barely eat take-out because I always feel like it’s too overloaded with stuff! Ha- I would be the crazy lady in Target talking to herself because the “do I really need this” conversations mainly happen while I’m there! I try to go through our stuff every spring (spring cleaning kind of thing) and look at what we need/want. It’s hard sometimes to let things go, but I always donate it- and I know it’ll get to have a home (somewhere). Gorgeous pizza, and I’m definitely going to have to try this topping! Gorgonzola is where it’s at! I definitely have a TON of clutter in my apartment and every few months I go through a binge where I get rid of EVERYTHING I haven’t used or thought about in the interim. I just hate having things I don’t need. So then for about a month the apartment is clean…and then I somehow clutter things up again. Sigh. It’s an endless battle. I love the simplicity of your pizza! Asparagus is so good right now, it doesn’t need barely anything else to accompany it! I adore the style you’ve developed 🙂 And love that you tell stories with your photos. I love the mood and the feel of your photos. I’m glad you are staying true to yourself & finding pieces that are meaningful to you. And this pizza looks incredible! This is a great post, Erin. When I first started my blog, I went out ‘prop’ shopping, came home with cool stuff and couldn’t take a picture I liked to save my life. Nothing felt right, until I took it all away and just used a cutting board, some parchment paper and my own bowls. I feel the same way as you – I need some history, some life built into my pictures. I’m really glad I’m not the only one. I bought so many pieces of fabric to serve as napkins and dishes that only sat on a lonely shelf in the basement- all of which was barely used because I ended up using my day-to-day dishes. I’m always trying to simplify things…especially my cooking. But it’s easier said than done! I’m loving this simple combo of ingredients on your pizza. I’m so with you on this one. Simplicity! I crave it. I’ve been doing some spring cleaning and I’m getting rid of some of the props that don’t fit my true style. I don’t even like the concept of a food photography “prop”. I just want stuff in my pictures that I use even when I’m cooking without my camera! You have great style and I look forward to watching it further evolve as time goes on. Last but not least, I LOVE shaved asparagus. I completely agree about “props.” The dishes I love lend themselves well to photography anyway so why have extra sitting around! You’re the second person who has written about simplicity this week and I love it. I find myself sometimes adding and adding to recipes when instead I need to think about taking a step back and sticking to something simple. Thanks for this great lesson! Your pizza looks beautiful :). Simplicity is good. And you made me want to go declutter, really look at the things I own. I prefer the more natural look in food photography. I think the really staged photographs are fine for in a magazine, but for a blog done by one person, it doesnt really appeal to me. I’ve only been following your blog for a short while but I quite enjoy it. Your recent post is like my subconscious coming to life…I am so tired of clutter! Perhaps it’s spring fever but I just want to get rid of half of my stuff!! I keep telling my husband that we don’t need to buy anything (except groceries). I feel like I’m drowning in consumerism. Keep it simple–life and food! Although investing in good cookware is worthwhile. great post! i love simple. and i love these toppings! i’m 31 and i live in a 500 sf studio apartment. i’ve recently discovered that i don’t care about anything i own, i don’t own much, and it really is best to make what you have count. This looks amazing! Love the pics, and the comments about simplicity. We’ve been meaning to try shaved asparagus – haven’t tried it yet! Is the raw taste strong? No- because it’s so thin it cooks up just perfectly! This pizza is fantastic. I’m not a big gorgonzola fan so I made it with sheep’s milk feta and I made it on gluten free girl’s whole grain gf pizza crust. A match made in heaven! keep making amazing simple and veggie based recipes! Loving this, pinning this to my board right away! 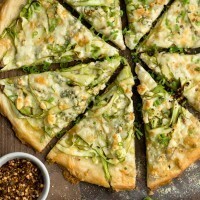 Really loved the shaved asparagus – I used the ‘Brooklyn Bred’ premade pizza crusts to save time, and pulled out my homemade pesto for sauce, topped with the shaved asparagus, caramalized onions, and cheese.yum! So glad for the shaved asparagus idea!! !